Senate Select Intelligence Chairman Richard Burr, R-N.C., speaks with staff ahead of the 2019 global threats hearing. Director of National Intelligence Dan Coats told members of the Senate Select Committee on Intelligence that the governments of China, Russia, and North Korea pose the greatest risk to the U.S. and its allies with advanced cybersecurity technology. Coats said advancements in U.S. intelligence technology are critical to deterring future threats from foreign adversaries. Chairman Richard Burr, R-N.C., asked FBI Director Christopher Wray and CIA Director Gina Haspel how China and Russia, in particular, are using private data to target U.S. security. Haspel said the intelligence community is working to break down how Russia and China’s collection of data is used against the U.S. government. “From the CIA perspective, a big focus for us is finding out how our adversaries are using big data against us and sharing that with our partners,” Haspel said. Senators also asked pointed questions about the Chinese and Russian governments’ infiltration of U.S. social media accounts. 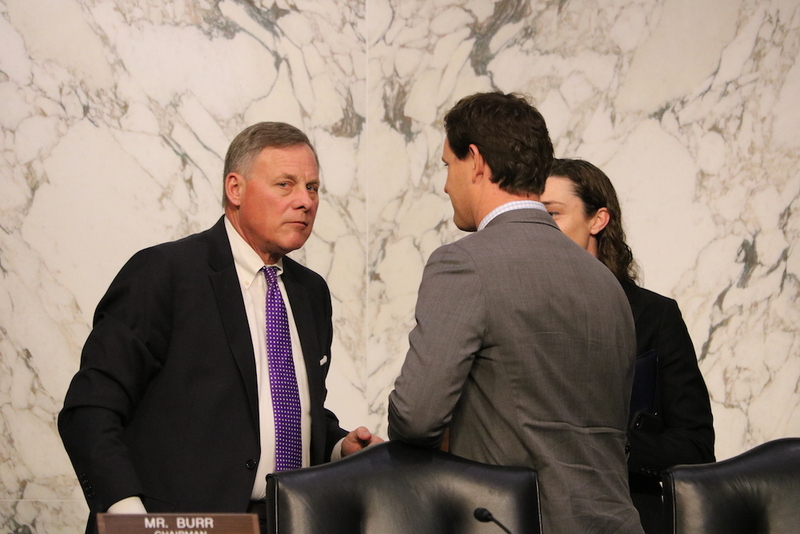 Ranking member Mark Warner, D-Va., questioned how the intelligence community can better work with social media partners like Facebook and Twitter to protect American citizens from online manipulation. FBI Director Christopher Wray said security threats from social media bots are a “vexing and challenging problem” for the FBI and intel community, but partnerships with social media companies are improving strategies. “One of the bright spots between 2016 and 2018 is how much more cooperatively we are working with the social media companies,” Wray said. Wray said there are only some success stories that could be shared in this open hearing, but social media companies have used the so-called IC (intelligence community) tips to block and prevent recent information warfare from the Russian government. Coats echoed Wray’s sentiments about improved cooperation with social media companies but the names of these companies were not explicitly stated. “There’s information we can provide them that is in their benefit and of course we always stress the fact that we need to work together to protect our people from influence activities from abroad,” Coats said. Several senators expressed concerns over new cyber threats from increasing cooperation between the Chinese and Russians. Sen. Susan Collins, R-Maine, pressed CIA Director Haspel about the U.S. Treasury Department recent decision to lift sanctions on Russian oligarchs allied with President Vladimir Putin. Frustrated with the initial response, Collins asked again if the CIA had expressed concerns over the U.S. Treasury’s recent actions. Haspel said the CIA did not raise concerns but did provide supporting intelligence about the oligarch in question. Sen. Jim Risch, R-Idaho, questioned Coats about how the U.S. plans to respond to China’s perceived rise to world power. Coats admitted that China has become a major competitor for the U.S. and that the U.S. government needs to catch up to China’s technological advancements. “While we were sleeping in the last decade and a half, China had a remarkable rise in capabilities that are stunning,” Coats said. Sen. Kamala Harris, D-Calif., fresh off of her 2020 presidential announcement, weighed in on the discussion and questioned whether the intelligence community plans to create a written strategy for addressing social media threats. In one of the more tense exchanges during the hearing, Director Coats told Harris to refer back to the previous parts of the hearing that she missed to answer her own question. In response, Harris pulled out the testimony from the last annual Worldwide Threat Index hearing in February 2018 and expressed dissatisfaction that a written strategy had not been drafted since last year. President Trump’s potential ties to Russia became another talking point for Senators at the hearing. “Donald Trump met privately with Putin and no one in the U.S. government has the full story about what was discussed,” Sen. Wyden, D-Ore., said. Wyden then inquired how President Trump’s possible connection Russia could impact the intelligence community’s efforts to undermine Russian influence in U.S. elections. Coats gave a brief response about the classified nature of his answer. The IC and law enforcement officials will be testifying on classified findings in the report during a closed-door hearing this afternoon.